#MySundayPhoto this week is of Bear. We had a fantastic morning at Dyffryn Gardens near Cardiff and took loads of photo's. What I love about this photo is that he is surrounded by acres of lawns and trees and there is so much to look at and enjoy and he finds a drain! He saw it and paused then thought about it and had a little peek. 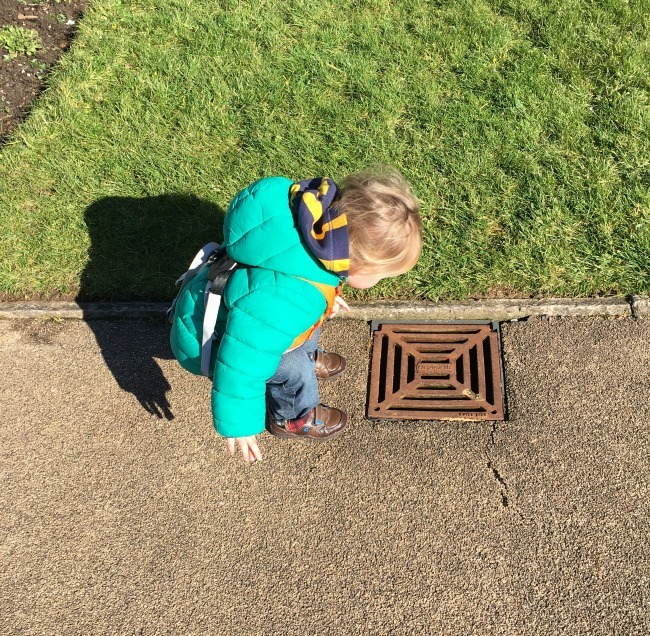 I told him it was OK to look at the drain so he crouched down to see the water. I just love the way little ones make us look again at ordinary things around us. How wonderful. I love these moments too. It is great to see little ones paying attention to the everyday objects like this. I'm enjoying looking at the detail again. The water in the drain, the shadows on the floor. He is making me stop and look. I love it. The mind of a toddler! May be he'll be an engineer when he grows up? Heh, it's funny what catches kids' eyes, isn't it? So rarely what you expect! I do too and being a granny I have time. Nothing has to take priority. It's great. Thank you. He certainly is! It opens my eyes. I get down to his level and see things differently. I'm loving it.